Im currently on the train back to London from Manchester Airport and I really have nothing to show you apart from this post I wrote a while ago on what I wear on a night out! Bit random, but it's all I got tonight unfortunately! Normal blogging will resume tomorrow! ETA: This makes me so depressed about how slim I was before I went on holiday! Sobsob! People often ask me to do outfits of what I wear out, and to be honest when Im going out I never have the time (or the light) to set up my camera and take snaps. Im normally not ready till about 5 minutes before we have to leave the house. I do often post what I wear on a Saturday on Instagram (@llymlrs)! But I got this playsuit in the post from Motel and I knew instantly it was going to be what I wore for my last night out before I went away on holiday! When I go out I generally just wear a dress or a playsuit, normally black and white of some description, minimal jewellery and massive heels. I have this playsuit in the feather print but asked the lovely Selina at Motel if I could try it in the black too. 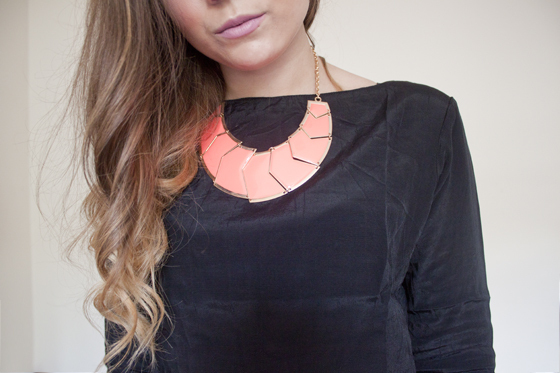 I paired with a neon necklace I got from Primark for around a fiver, which I have to admit I really, really love! Primark have some really nice jewellery at the moment, I normally skip it as I don't really like gold jewellery but this did catch my eye. Then matched my necklace to my bag which I got from New Look around 6 months ago. Finished off with my light grey Primark heels which are incredibly battered as I wear them so often. Dirty London bars & light heels don't mix very well! But I liked the way the neutral colour looked with the black and the neon! Excuse the nails, I did actually change them to Models Own Hedonist to go out in! Absolutely love this outfit, looks great on you, especially with the orange! And I can't believe those heels are primark!! I can't believe those beautiful heels are from Primark! They do some really good heels especially for nights out since they're cheap - my all time favourite wedges are from Primark and I don't mind that they get grubby. You look gorgeous as per! very pretty lily - jealous of your legs too! Great outfit!! LOVE the nails! You look lovely, and absolutely tiny! 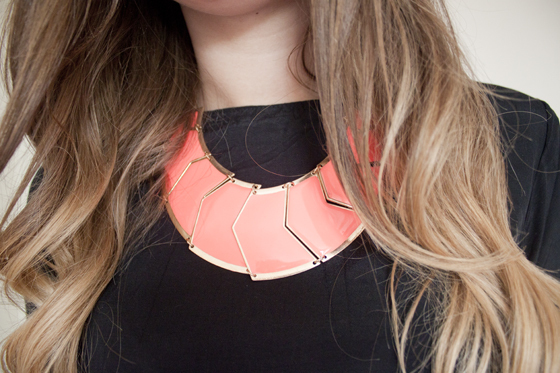 What a great going out look, especially love the neon necklace! Oh my goodness I am in love with everything! Your playsuit, your clutch, your nails, and your necklace! The playsuit looks like it'd be more expensive that motel! I Love it! 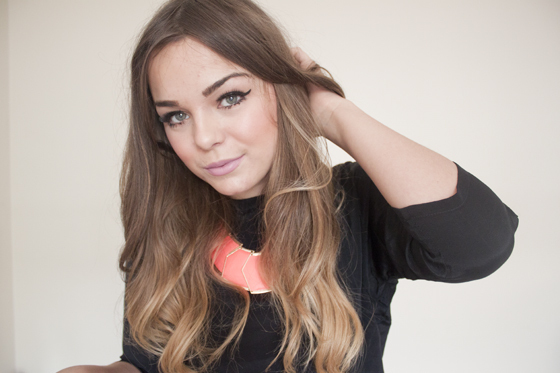 the playsuit is gorgeous and love how you've styled it! This outfit is so gorgeous! i love everything about it! You look so beautiful, I adore your hair! Looove the necklace! Love this. I would never have even considered a playsuit in that material but it looks so good! it's wonderful! love the accessories! You look amazing and I love your nails! love that playsuit, great outfit! really love your nails, they look great, the dots are perfect and the colour is gorgeous! This playsuit looks gorgeous on you, very flattering!! Would you mind saying what size you're wearing as I'm thinking about purchasing it! 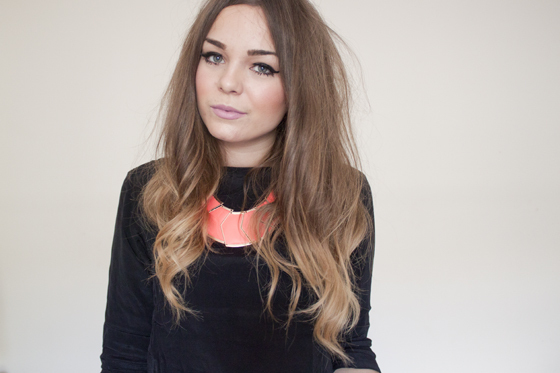 I absolutely love this playsuit, looks great with the coral necklace! really love that playsuit! also regretting not picking up that necklace still, been trying not to think about it. bought a few in place of it though. still wanting it though!